Junior De Los Santos Galan is one of the first students enrolled in the new CIS networking and security associate degree program. 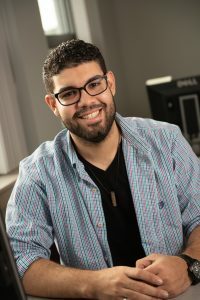 Three years ago, Junior De Los Santos Galan could barely say hello in English, now he is better than half way through Northern Essex’s computer & information sciences newest associate degree program in networking and security. The 24-year-old Methuen resident was raised and educated in the Dominican Republic. When he was seven, his mom, a schoolteacher, purchased a computer. It was an instant hit and source of entertainment and admiration for Junior and his friends. “I was amazed at this device and that it could make music, help you learn new things, and let you type letters. It was like something from a new world”. It was no surprise then that Junior elected to study computer science technology in high school. He graduated early and by the time he turned 18 had secured a coveted position as an administrator for a supreme court judge. When the office realized he had an affinity for computers, he became the IT guy too. From there he transitioned to working in computer security for a bank. As good as life was going, when Junior’s stepmom, who lived in the United States, asked him to visit, it was an invitation he accepted. “I always dreamed of coming to the United States, but didn’t know where to begin,” he said. At 21 years-old, he arrived understanding English, but unable to speak it. He was a quick study in ESL classes and quickly enrolled in Northern Essex’s CIS courses. In addition to attending NECC full time, he works three jobs – as a package handler for FedEx, an NECC work-study student in IT services on the Lawrence campus, and online salesperson. He is interviewing and looking forward to an internship during the spring 2019 semester. By December of 2019, he will have completed his studies at NECC. He anticipates transferring right into Northern Vermont University’s bachelor’s degree program in computer information systems, which partnered with NECC to offer classes on the Lawrence campus. He will be happy to continue taking the classes on the NECC campus, he said. Northern Essex offers associate degrees in computer science transfer, information technology, networking and security and technology in business. For additional information go to the program page. Northern Essex is enrolling now for the spring semester, which starts January 23. To learn more, visit the website, www.necc.mass.edu, or contact enrollment services, admissions@necc.mass.edu or 978 556-3700.